I lived in 23 Albert Square – on the corner with Wilkinson Street with St Stephens Church at the end of that. Roger Moore lived a few doors from me and we also went to school together. He was a few years older than me but we all used to climb trees and play together. There were lots of children who played together, I remember Doris Fenn and the two Italian girls Enrica and Gioconda Zucchini who lived in number 19. Their father had been sent to the Isle of Man for the duration. In my house was an acrobat act called Rolls and Falls who appeared regularly at the Empress Theatre, Brixton. In the basement was “Baby Sylvia” who also did weird things with her body in the theatre. I used to take tap dancing classes in Morat Street. I was about 7 years and it must have been just before the war. Such a long time ago. One part of our school on Hackford Road was called Brixton Central and it was this part which got a direct hit in the blitz. We were sent to Cowley Road, a nice modern school where there were quite a few male teachers who’d been invalided out of the army. But we never missed lessons. I look back and know perfectly well that today’s pupils would never be able to put up with what we did. And all the subjects we had that seem obsolete today. Nature study (we were taken on rambles as far away as Barnes sometimes for this) art, cookery, geometry, French, English Literature, Arithmetic and Algebra. I had extra tuition from 4-6 for shorthand and typing. What an education and so many things learned and used today. After Cowley Road we were sent to Vauxhall (next to a laundry) and to another school near to the Oval where the Headmaster was a Mr Gerard. I remember headmistress Miss Drinkwater and many teachers Miss Boswell, Miss Harrison and one who lost her husband in the fighting. There was a French teacher called Miss Spencer. There was also a male teacher called Mr Taylor. Opposite was a sweetshop and a grocer run by Syd of questionable gender but very nice to us kids. We had been evacuated to Brighton – bombed out and then on to Egham – bombed again whereupon my mother brought me home again to Albert Square. I wish I could trace my friends from those day but being girls they changed their names upon marriage unlike me who became an actress and never changed my name even after I married. Too confusing for getting pay cheques. I remember one terrible morning when we heard that so many girls – working in the Freeman’s building had been killed. It was opposite Albert Square. I was 10 at the time and used to help a young lady vet who had a houseful of bombed out cats and dogs on the corner of Albert Square and Clapham Road. Her name was Iris and she helped everyone. I still know how to give animals pills because Iris showed me how. A lovely family lived there called Beani and an Indian Doctor too. In the square I lived in number 23 and a few doors along lived Roger Moore with his mother and father. His father was a policeman. Next to him was the Zucchini family and we were all so sad when Mr Zucchini was sent to the Isle of Man for the duration. My 2 friends were Gioconda and her sister. Terrible but happy days long gone. I am almost 84 and Roger Moore is 87 now. I remember Butterfly Theatrical Make up. It was as you walked up Robsart Street (is it still there?) toward Brixton Road there was a large pub slightly to the left across the road I think. But if you turned right and crossed the Brixton Road there was a big pub and Angel Road. Going toward Brixton itself on the left was a terrace of shops and Butterfly was one of them. Lots of actors were always in there buying their powders and greasepaints. I learned all about the various numbers of the greasepaint sticks well before I got my first job in Repertory some years later. Their big competition was Leichner and I think they went out of business just after the war because I could never buy their products when I became a pro. Next to Butterfly was a super attraction. A home-made sweet shop where they actually made everything in the window. So we got to see rolls and rolls of toffees, fudge and and rock being made. But they had to close down in the war when the sweets were heavily rationed. They used their stocks of sugar till the last grain. I also recall Spurgeon’s Orphanage although I never knew it when it was an orphanage but absolutely remember going there day after day in school holidays for a wonderful lunch. The big area which had obviously been an assembly hall, was turned into a British Restaurant. The meals cost one shilling and a penny and were always really good. 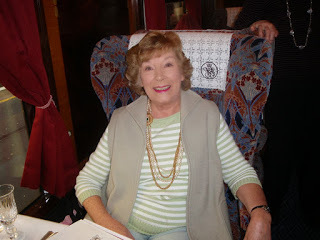 My friend was Jean Bloom whose Father was the A.S Bloom of Blooms Bakery at 63 Stockwell Road. When we were allowed we often went into the little Ritz cinema – just before you turned into Stockwell Road. The Swan pub was on the other side of the road. It was a horrible day when most of the residents were having to sweep up all the broken shop front glass after a raid the night before. If you walked right up the length of Stockwell Road you’d reach the heavenly Astoria Cinema with its most beautiful starlit sky interior. Jean and I (both aged about 12) actually asked for the manager to show us how the actors appeared on the screen! We really believed they were real. He took us into the control room where we saw the sound track records and how the projectionist had to synchronise the lips to the sound in case the actual track broke down. It did once in a Dorothy Lamour film he said, so they always had to stand by for disasters. During the war we were bombed out from Albert Square and my mother and I moved to Richbourne Terrace which was quite near to The Oval. There was a small cabin on the main road at the beginning of Richbourne Terrace which was always open for Peas Pudding. Oh so delicious and a huge treat as we were so miserably deprived of luxuries at that time. Alas the whole of one side of the Terrace was demolished one lunch time, by either a doodlebug or a rocket. That was towards the end of the war. Our house was simply cracked all the way down, so we again had to move. We went to Stockwell Park Crescent after that and stayed there for many years. My father had been missing presumed dead at this time but the move was a huge help. It put my mother on the road to security because the Council offered her the house at number 35 for £400! Can you imagine? It was double fronted with white steps up to the front door and had a lovely May Tree in the front garden. There was a bit of war damage down an outside wall but it was no deterrent. Then next door was offered when the tenants moved out so she bought that too for £750. She decided to move away when we were robbed many years later. Oh my mother was so clever. Always had ‘good contacts’ and somehow there was always good food on the table even in the darkest days. I lived in no 37 in between jobs in the North of England and kept it as my London base for years. We had 3 actors living there as paying tenants too. My son’s first school was St Helen’s at the top of Robsart Street. He later travelled on his own to Oakfield which was a starter school for Dulwich College. No fear of him going it alone on the tram in those days. I bought my first bike from Pride & Clarkes on the Stockwell Road and later my Lambretta. The bike was £4.9s.6d and was my pride and joy throughout my schooldays. I used to have a job delivering papers from that shop on the Stockwell Road where that poor little girl was shot a couple of years ago. It was then a paper shop and sweet shop and was called Dubig’s. I earned 4s6d a week and did the job on my bike. No health & safety then. Somewhere along the way common sense has left the present generation I fear. My son often suggests we go back and look around. I wonder what we’d find? Well, finally my son Robin and I decided on a day out revisiting Stockwell and so we drove up last Thursday. 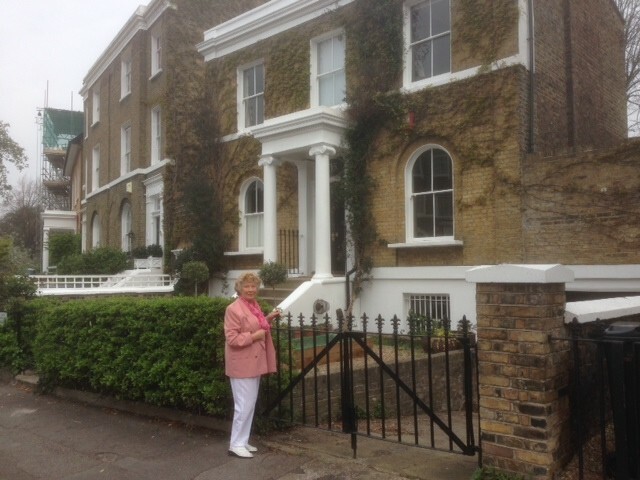 Quite a nice day – left early and made our first port of call Stockwell Park Crescent to take a look at the house my mother bought after our final bombing out toward the end of the war. And were we delighted with what we saw. The Crescent had lost none of its charm (apart from the endless parked cars) and number 35 and 37, (both had been finally purchased by my mother) looked really lovely. We were delighted also to see those opposite painted in soft pastel shades and were tremendously attractive. We stopped the car and got out to take a closer look. I wish someone had been at home but we got talking to a resident opposite and I swear he went white when I told him of my mother’s original purchase price. Same applied to me when he told me the value today! You see, after our last bombing we landed in Stockwell, nice house but a rather large crack all down the side and the next door one full of people in a similar plight. But there was a lovely May tree in the front garden (gone now) and a lovely little garden at the back. We never knew who owned the house but Mother paid rent to Lambeth Town Hall. After a couple of years they approached her to purchase the house to take it off their hands for £400. Yes £400! Mother dealt with the crack and we were set up for the future. Especially when the house next door also got offered. Slightly more this time at £1200 and although it was a dickens of a fight Mother raised the money and I moved into No. 37. That’s where I brought Robin home to from The General Lying In Hospital at Lambeth bridge where he was born. Such happy memories. Moving on we decided to have a roam around. The splendid resident offered his driveway for our car, as parking for strangers was impossible, and off we went to Robsart Street and oh dear how I wish we hadn’t. Gone were the little shops and in their place stood a monstrous high rise. Quite out of place at the top of a narrow street. But the little school gate was left intact on the other side of the road where once stood St Helen’s School. We then went down Stockwell Park Road and Groveway. We remembered who had lived where and it was sentimental fun we really enjoyed. Not finding anywhere for lunch nearby we drove off into Brixton and saw a place to eat opposite what had been the Astoria Cinema. It was OK and colourful so we parked and had a weird chicken offering before we got on our way, this time to Albert Square, our first bombing out from number 23. The square looked fabulous although the green itself was bereft of its shrubs and bushes, I did remember the trees and which one I knew Roger Moore had climbed so often! Sad to remember what had happened at the Freeman Building all those years ago, but it now was a decent block of flats. We carried on a bit up the Clapham Road and found Richborne Terrace where we had our last dreadful bombing. You can quite easily see the whole row of houses that had replaced the entire wiped out part of the terrace. That was bit sad to remember but not for long. We then headed through Durand Gardens, such classy houses, to my old school in Hackford Road. No little sweet shop opposite, and the school gates all locked up – a sign of these times I guess although the children must have been inside. We could see where my part, Central School on the corner had been demolished by the bomb and rebuilt and Hackford Road itself looked lovely so we left very happy with our visit. Time flies and we had to return to Guildford via the very last place we had lived before buying my house. Called Edge Hill opposite the church in Wimbledon. Lovely memories. Sorry to say I have not visited the site for a time. So glad you recall Butterfly. I was delighted to see so much of my life restored so well but quite horrified at Robsart Street. It is lovely to have contact with anyone from there. Such dreadful times yet marvellous memories. I now live in number 23 and am so very grateful for these stories. If you come to visit again please get in contact and I would be happy to show you inside the old Place. Oh so many memories, taking me back to where I was born. I went to Hackford Road School, left in 1939 just before the war started. I had no school to be evacuated with, so I was left in London at 14 Sidney Road with my dad and older brother. Our garden backed on to the ones in Stockwell Park Road, I used to have a chat with a very nice lady and her teen aged son who lived there, I don’t know their name. My teacher at Hackford Road School were Mrs Curtis, Miss Laundry, Mrs Taylor, Miss Peacock and a very vivacious head mistress name of Miss Capon. Wonder if any of the 1939 leavers are still around, I would love to hear from them. Joanie Harris (my name then). I recall the wonderful Miss Capon always, but always, wore RED! This brought back such wonderful memories of my childhood in Brixton and Stockwell. Thank you Pearl. We lived at 14 Sidney Road, Stockwell. At the very back of the garden was a brick wall where I used to talk to a very nice lady who had a son of about seventeen. I well remember Bloom’s baker’s, when one of us kids had been to the dentist, mum always took us to Bloom’s and let us pick out any cake we wanted!! Our house has been demolished now, it was directly opposite the Grosvenor pub, which is now closed down. Pearl, I just loved reading all about the places I used to live. I went to Hackford Road school also until I left in 1939. Wonderful teachers there, Miss Capon was the headmistress, then teachers Mrs Curtis, Mrs Taylor, Miss Prothero (she used to throw chalk at me) Miss Peacock, Miss Laundry, Miss Carlisle. Those days are long gone, in fact I was told that my old school has been turned into flats!! No the school is still there. Goes under another name. Is it Durand? I got the chalk too from Miss Prothero! Bloom’s was a lovely shop. Run by Stanley and Mrs Bloom. My best friend was Jean. She married an American and went to live over there. I stayed with them in the early 60s when I went out to Hollywood. They lived a few miles away in a olace called Northridge. I wish I knew what happened as they totally disappeared in spite of much trying by me to keep in touch. PS. Just remembered Miss Peacock. She walked in very long strides! I was bought up in 25 Lansdowne Gardens.. Lovely house, still is… Reading your article bought back a lot of memories.. My father had a dry cleaners/alterations shop in Stockwell Park road on the left going towards Brixton.. My Aunty lived in a small road behind the Astoria, unfortunately the houses have been pulled down and flats erected in their place .. I used to go to Saturday morning cinema at the Ritz Stockwell..
Joanna Lumley has the large centre house in Albert Square. This is next door but one to where Roger lived with his Mother and father. I even have been in Roger’s bedroom! Imagine! Why? ‘coz I fell off my bike and Roger’s mum hauled me up the stairs and fixed me up and made me lie down on his bed. I told Roger this many years later when we bumped into each other at some ‘do’ on the dreadful day that Kennedy was shot. Talking of Joanna Lumley’s house – one of our ‘group’ was Audrey Whittlesea and her auntie used to make garters for a living in the basement of that house. I was about 10 at the time but had a pretty good talent for painting things. So I was asked to earn some dough by painting blondes, ginger and dark haired glamour girls on to wooded buttons, which Auntie Elsie would stitch on to the garters. I got a shilling a button. Wow! Was I popular in the baker’ s bum department. I meant BUN dept of course. So many memories have flooded back after reading your memories Pearl. I lived just around the corner from Richbourne Terrace in Charmouth House Dorset RD. I had a couple of friends who lived in Richbourne Terrace. I knew Albert Square very well and we had an Indian doctor called Kalra. I can remember siting in his surgery with him smoking and coughing his lungs up. Many years later I married a lass from Birmingham and lived there for ten years. Early on there I caught a bad attack of the flu and my wife called the local doctor to see me. He was Indian and named Kalra. I mentioned that I knew a doctor Karla in Kennington when I was a young lad and low and behold it was his Uncle. Such a small world! I bought my first bike at Pride and Clarke’s more expensive than yours at fifteen pounds, it was a second hand Claude Butler if that means anything to you. I was so proud of it. I have just revisited my offerings on the wonderful Oval website and came across your letter about your times in and around Richborne Terrace. And now you are in Australia and I am in Guildford. Hope all is well. I am now 86 and just keep rolling along. I do find it so comforting that people around still know of the same places I did in my youth. There were terrible times we know but isn’t it odd the way we love to remember? And it’s always the GOOD things that come first. Robin and I did the trip again a few weeks ago. The houses in Stockwell looked somewhat scruffier than the previous year but the owners actually let us in and we were able to see again the rooms. We never met the owner of 23 Albert Square as he had a business deal at the last moment but we will go again when the weather gets better. Love it. I was born at 5Richborne Terrace in 1946. My Dad worked at the Black Cab garadge in Meadow Road. I remember the doughnut factory next door to Freeman’s so delicious! We were evicted in 1959when the old Axis Fans factory behind our house was bought by the bubble car manufacturers who then bought our house. It is all gentrified now. You said that you lived in Richborne Terrace during the war. My Nan, mum, dad and brother and sister were living there then at no 5 the first house coming from Clapham Road. We had to move out in 1959. I was born at no5 the big room on the second floor. Loved the Terrace and all the fun we children had. There were prefabs on the other side where the houses had been bombed. They are two story flats there now….Kay. love to hear your reply. Pearl, You said that you lived in Richborne Terrace during the war. My name, mum, dad, brother a d sister lived there then. Number 5 just off the Clapham Rd, My sisters name was Claire and my brother Teddy. Have a picture taken of my brother outside on his trycical there iron railings intacked, later taken to be used in the war. My name rented the whole house and she used to have lodgers. Do you remember them? I was born in the house in ,1946. We had to move out in 1959. ?kay stiff. I so love to read all your replies. Thank you everyone. i just came across this site and reading about stockwell and Brixton brings back many memories. I was born at 18 Landsdownway, which was pulled down in 1961 to make way for a block of flats. My mother went to hackford school as well and new Roger Moore she was senior to him.Her father was also a policeman his station is near the imperial war museum. My father was part of the Bert,Bert and Bert act also cyclonic ‘s his family lived in Blenhiem Gardens Brixton. The Ritz I well remember and the Astoria was so magical when the lights went down.